In honor of its 40th anniversary, Tomlyn, creator of at-home veterinary-quality health and wellness pet products, is asking pet owners to share why they love their furry family members by entering the 40 Reasons I Love My Pet Photo Sweepstakes for a chance to win 40 prize packages through March 20th. 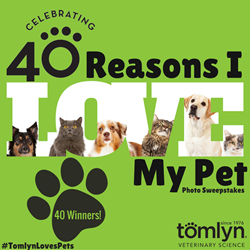 Submit a photo of you and your pet explaining why you love your fur-baby, with the hashtag #TomlynLovesPets 40 Winners! “We are constantly motivated by the special bond between families and their pets, and believe that it is our responsibility to help give pets the same unconditional love and care that they give us,” says Tabitha Cromer, Tomlyn's marketing manager. In honor of its 40th anniversary, Tomlyn®, maker of the popular line of at-home, veterinary-quality health and wellness pet products, is asking pet owners to share why they love their furry family members for a chance to win 40 prize packages. Through March 20, 2016, enter the Tomlyn’s 40 Reasons I Love My Pet Photo Sweepstakes by submitting a photo of your pet explaining the reason(s) you love your four legged companion. The 40 winners, randomly selected, will be announced on March 22, 2016, and all will be featured on Tomlyn’s Facebook page, Twitter feed and Instagram channel. One grand prize winner will receive a $500 store gift card to a national Tomlyn retailer of the winner’s choice, along with $100 of Tomlyn’s popular pet health and wellness products. An additional 39 winners will receive a variety of Tomlyn pet health products specifically for their pet(s) valued at $50 each. To continue supporting animal shelters and rescue organizations, if any of the winners in the sweepstakes are photos of rescued or adopted pets, Tomlyn will donate a basket of Tomlyn pet health product products to the shelter designated by each winning entrant. To enter your pet’s photo, visit the official entry form for more information, official rules, entrant gallery and instructions on how to upload the image. Tomlyn®, a pet health and wellness company founded in 1976, carries a complete line of scientifically developed, veterinarian-approved pet health products. The company’s wide range of product categories range from immune support, vitamins and supplements and hairball remedies, to joint and hip support, calming aids and sanitizers. Known as the maker of Nutri-Cal® and Laxatone®, Tomlyn is owned by the ninth-largest veterinary pharmaceutical company in the world.